How Far is Sri Dhatri Orchid? Great living is the ultimate desire for most but is a truth only for a select few. And therefore every idea and thought needs to be carefully spent to acquire the best, for it's your desire that counts…. 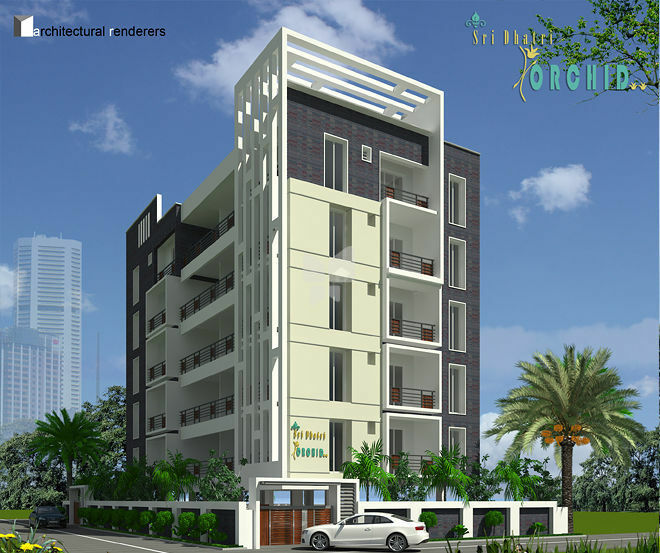 'Sri Dhatri Orchid' has a total area of 623 sq yds of which 5 Three Bedroom flats of 1690 Sft with East facing and 5 Three Bedroom flats of 1640 Sft with North facing. Sri Dhatri is proud to present its latest luxurious offering 'Sri Dhatri Orchid', at Sai Goutham Colony, Manikonda which not only brings the joy of luxurious living but also puts you amidst a great community which you have always dreamt off. Which is why, we call this project your dream project, because you build nothing but your own world with luxurious living and great community. Concealed Copper wiring of POLY CAB make and modular switches of PHILIPS or equivalent make. Power outlets for Air Conditioners in Master & children's bedrooms Power outlets for geysers and exhaust fans in all bathrooms. Power plug for cooking range chimney,refrigerator,microwave ovens, mixer/grinders in kitchen.Washing machine and dishwasher in utility area. Three phase power supply for each unit with individual meter boards. MCB's of reputed make for each distribution board.